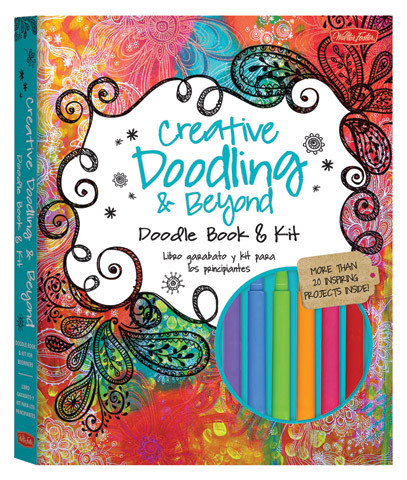 This kit includes a 40-page project book with more than 20 inspiring prompts and projects along with a selection of colorful art tools. Artists will learn to doodle number and letter compositions, whimsical borders, flowers, faces, clothing, and unique patterns and shapes. Techniques include doodling with closed eyes, progressively growing a doodle, creating repetitive motifs, incorporating rhythm into a composition, doodling crazy critters, creating scroll-like motifs, designing easy gift tags and a personalized seek-and-find game. The included materials provide all the essentials for practicing every prompt, technique and project inside the project book. With the professional quality drawing pencil, sharpener, eraser, eight colored pencils, eight fine-line markers, loose-leaf drawing paper, lined paper, colored cardstock and poster paper included in this portable, magnetic-closure kit, artists are fully equipped for easy, on-the-go creativity.